When I became editor of the Film and TV section of the Express, the one thing I looked forward to most was being lucky enough to be able to cover the very final season of Game of Thrones. With this in mind, I have decided to dedicate the entire final issue of this year’s Film and TV section to the Battle for the Throne. Tighten your scabbards and keep your dragon-glass close, because Winter Is Here! Arguably the two biggest names in the show are Jon Snow and Daenerys Targaryen. I personally feel that it will much more likely be Dany who fails to survive to the end. If we assume that the show is still tied to the books in terms of lore, then the legend of Azor Ahai tells us that the legendary hero was forced to sacrifice his true-love to forge the sword that was used to defeat The Long Night. I do believe there is a possibility that Dany may sacrifice herself symbolically to help defeat the Night King, or, alternatively, that Jon will fail to save her in favour of the greater good. It all depends on how much the show writers veer away from the source material. Maybe Dany and Jon will live happily ever after in perpetual paradise. Personally, I doubt it. Another storyline rooted deeply in the prophecies of Martin’s books is that of the Valonqar (or “Younger Brother” in Valyrian). The Valonqar prophecy was given to Cersei when she was a little girl (as seen in the first episode of season 5) and predicted not just the death of her three children but also her own at the hands of her younger brother. Cersei naturally assumed that this meant Tyrion, but it is generally accepted that the prophecy in fact refers to Jaime: he is Cersei’s junior by a matter of minutes. Whether this will happen in the show is again debatable, but I personally feel it would be a very satisfying end to Cersei and Jaime’s respective story arcs. Cleganebowl – a fight between The Mountain and The Hound – has been mooted by fans since the two first squared off at the Hand’s Tourney in Season 1 and the fight was again teased last season. Although I would love to see the two Cleganes tearing chunks out of one another, I feel that any fight, at this stage, would be so manufactured and convoluted that it would be for the benefit of nothing but fan-service. Game of Thrones has, unfortunately, become more and more crowd-pleasing since Dan Weiss and David Benioff took over full creative control, so don’t discount Cleganebowl being thrown in for the sake of it, although I hope that, if it is included, it has some genuine significance to the story. In a similar vein to Cleganebowl, I feel almost certain that Hodor will appear as a wight in the Night King’s army. I hope it doesn’t happen, it would be twee, utterly unnecessary and would tarnish the memory of his heart-breaking and heroic final moments but, if I was a betting man, I would stake some money on his big, rotting frame popping up at some point. This is another popular fan theory which I could easily see being true. Having Sam settle down in the Citadel in his old age to tell the story of Jon, Dany, Cersei and the rest would feel like the perfect rounded ending to the Game of Thrones story, if one that is a little too cliched and perfect to be truly considered likely. Much mooted and much discussed, I struggle to see how he could be seeing as we saw the Night King being created in a Season 6 flashback and the man who became him definitely wasn’t Bran – he had blond hair and working legs – but I wouldn’t put it past the writers to pull off some kind of chicanery involving time-travel and Bran’s vision which would result in another circular ending where the young Stark has to defeat himself. This would be a shocker but would fit in nicely with the “all men must die” mantra that has been repeated throughout the show. The idea is that the Night King’s army will be successful in wiping out all life in Westeros, thus winning the Game, before advancing to King’s Landing and taking his rightful seat on the Iron Throne. The Throne, however, is made of swords melted together by dragon fire and it has been shown that both dragon’s fire and Valyrian Steel (supposedly forged in old Valyrian with the magic of dragons) can kill White Walkers. How bitter sweet would it be to see all our heroes die and the Night King sit on the Throne, only to shatter and all his armies to similarly disintegrate. It is unlikely but would truly mark a return to the brutal and unpredictable brilliance of the earlier seasons. Bear with me here. The final season is only six episodes long and you would expect the final battle to take place in the last, or at least the penultimate episode. It has, however, been scheduled for Episode 3 which seems surprisingly early. In Season 7 it was shown that Cersei lied about supporting the Starks and intends to let the Night King wear down their forces before attacking them herself. 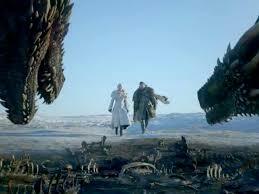 Couple this with the fact that she has hired the Golden Company, whose leader Harry Strickland can be seen in the latest trailer, and it seems rather unlikely that they would bring in an entire new group of antagonists and actors only to have them killed immediately by the White Walkers. Is it possible that Jon and Dany will defeat the White Walkers early in the season, albeit at great cost, only to immediately face the threat of Cersei in the South? It would stand out as a definite shock, and in my opinion would mark a very satisfying return to the real Game for the Throne that we saw in Seasons 1-4, as well as satisfyingly rounding off Cersei and her role as the true antagonist of the series. Will it happen? Again unlikely, but it is, I think, one of the more plausible curve-balls the show might throw us. Definitely nailed on, if you’ll forgive the pun. The trailer hinted at it and it is a pretty much a certainty that Jon, aka Aegon, will fully embrace his Targaryen heritage and ride one of Dany’s two remaining dragons into battle, although it is tempting to wonder what poor Ghost might think about his master getting a new pet. Ok, this one is very farfetched, and based on a meme I saw, but is still a really cool idea if you think about it. Westworld is a TV show which, like GoT, is made by HBO. In Westworld, people can visit a massive, interactive world based on the Wild West where robots who look just like real people act out predetermined storylines which visitors can interact with as they please…you can see where I’m going with this. In Westworld it is confirmed that there are other “worlds” made by the same company. Is it so bizarre to imagine that Game of Thrones might take place within this same structure, and that many of the characters are part of a predetermined scenario which has been reaching its conclusion for the last eight seasons? What characters in the series might be robots? What characters might be real? In the meme I saw it was Tyrion and Cersei who were visitors to “Westeros World”…definitely an unlikely scenario but imagine how mind-blowing it would be.